← Would you like a side of corpse with your meal, Sir? This entry was posted in Beef, Bias, Chipotle, Effiency, grass-fed, Integrity, Intensification, Pork, Sustainability and tagged Beef, Chipotle, Factory, Food, Marketing, pork, Widget. Bookmark the permalink. Great post. Unfortunately, activists and conspiracy theorists have ruined the whole concept of subject matter experts with their cynicism. What this means is that no matter what the expert says, it will be rejected as biased. I know that it’s the science and the facts that matter, not who says them, but the real challenge is getting others to understand that. I too am frustrated with the Chipotle commercial, but what frustrates me even more is hypocrisy. Where is the outrage from farmers about the new Got Milk campaign? It incorrectly states that plant milks have”unnatural” ingredients when those ingredients are really are quite natural (seaweed, etc) and safe. It uses loaded words like “spooky” and in no uncertain terms tells the consumer that anything but cow milk is gross. Don’t even get me started on the cute cartoon cow on grass (when only a small percentage of dairy cows are pastured) and all the health claims that milk is the best way to get vitamins when we all know that it’s good, but still just one of many vitamin laden foods. This ad is just as misleading as the Chipolte ad in my eyes, but because it’s pro dairy no one’s complaining. We should all work encourage truth in advertising for all sectors, not just the ones we like. Everyone takes this commercial so literal. 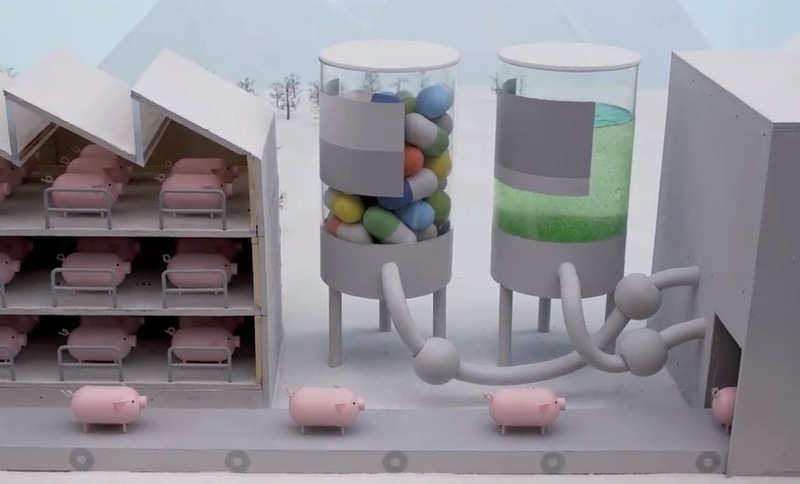 There are no towers pumping antibiotics and growth promotants into the hog buildings. But they do put antibiotics and growth promotants in the animal feed. There are no tubes discharging green slime into rivers. But hog manure lagoons do sometimes contaminate our waterways…remember Hurricane Floyd? You mention how grass is the basis for beef production. I agree! Then why do you suppose we fatten cattle on feedlots with corn for ~ 120 days before slaughter? It’s not a closed loop if we start adding in grains. Grains make the cycle that much more complicated and unstable. At least you didn’t knock Willie Nelson’s rendition of “The Scientist” — everyone else seems to just want to hit him below the belt and say he “butchered” it. People like myself don’t want to eliminate livestock production…we just think the current system of production needs some adjusting. Thank you for sharing your opinions in this post!